The Amateur Traveler talks to Nathan from Wand’rly Magazine about Great Smoky Mountains National Park and about his current home of Western North Carolina. The Great Smoky Mountains National Park is the most visited National Park. The Amateur Traveler talks to Jen Russell about the 3rd smallest state in the U.S. Connecticut. Connecticut, the Constitution State, is located halfway between New York and Boston. It has a coastline sheltered by Long Island so more suitable for family frolicking than for surfing. Connecticut also has a long maritime tradition which is celebrated at Mystic Seaport. It's forested rolling hills are popular with people who come to New England in the Fall to see the Fall colors. Connecticut is rich in U.S. history producing people such Revolutionary War patriot Nathan Hale ("My only regret is that I have but one life to give to my country"). It is rich in natural history as evidenced by Dinosaur State Park. The Amateur Traveler talks to Antonello Losito from Southern Visions Travel about his native region of Puglia (Apulia) in Italy. Puglia is the boot of Italy and does not get the same number of tourists as Northern Italy. But Antonello recommends his rugged coastline and mountain towns as a way to see the Italy that "most Americans picture". The Amateur Traveler talks about traveling to the Hawaiian Island of Lana'i. I recently spent a week in Lana'i as a guest of the Lana'i Visitor's Bureau as one of their 2012 "Artists in Residence". Lana'i only has 3,000 residence and a small town feel. I talk about some of the more unusual (for me at least) activities that I tried on the Island including riding a horse, going on a ride and shoot (to Lana'i Pines Sporting Clays), snubing, learning to play the ukulele, getting a lomi lomi massage, volunteering at a cat sanctuary and going 4 wheel drive tour. You don't have to do this much when you go to Lana'i. You could also just golf or lie on the beach. The Amateur Traveler talks to Matt Long from LandLopers.com about his recent trip to St. Kitts (officially part of the Federation of Saint Kitts and Nevis) which is part of the Lesser Antilles in the Caribbean. Matt was on a press trip to the Marriott resort on the island. St Kitts was one of the last of the Caribbean islands to switch from a sugar economy to a tourism economy. The Amateur Traveler talks again to Photographer Ralph Velasco about the state of Chihuahua in Mexico. Ralph was recently on assignment throughout Mexico but this region made the biggest impact on him. Chihuahua is known for the beautiful Cooper Canyon which is best seen from the train that transverses it. Copper Canyon is larger and portions are deeper than the Grande Canyon. The Amateur Traveler talks to Joe Bickley of Alaska Backcountry Consulting about traveling to Alaska, particularly the interior and back country. Alaska is a bug state and Joe lives in the center of it near Fairbanks but at the northern end of the Alaskan road system. Joe gives us some directions on places to go to see Alaska's vistas and encounter its wildlife. He takes us above the tree line at Denali National Park (aka Mt McKinley) which is not quite half the size of the state of Rhode Island. At that Denali is not even the largest National Park in Alaska. That honor goes to Wrangell-St. Elias. Alaska also has the largest National Forest which is Tongass National Forest. Joe takes us to one of his favorite spots off the Denali "highway". He also directs us down to the Kenai Peninsula known for great fishing and also to the town of Homer with its artist culture. Learn what some Alaskans call those bells that a tenderfoot might wear to scare off bears. The <a href="http://AmateurTraveler.com">Amateur Traveler</a> talks to Zoë Dawes from TheQuirkyTraveler.com about England's Lake District. This beautiful pastoral area was made famous by the poets and artists in the romantic period, most notably William Wordsworth. Not far from industrial Manchester, the lake district is still a refuge for hikers and and other tourists tucked away in northern England. Zoë describes some of her favorite hikes like the coffin trail along the shores of Lake Windermere and favorite villages like Ambleside. Zoë says "we have what we call mountains, very quaint villages. It's a farming community area, a lot of history, a lot of literary artistic connections. There is a kind of microcosm of what England is, but you feel a little bit like you are stepping back in time as well." The Amateur Traveler talks to Roni Weiss about his visit to the divided country of Cyprus. Roni went to Cyprus in part to complete a quest to visit every country in Europe. Roni couchsurfed which gave him a chance to stay with Turkish and Greek Cypriots as well as a Turkish resident. The Amateur Traveler talks to Carla, Jason and Janie about their trip to Nambia. While traveling in southern African to attend some of the games of the World Cup the three made a visit to nearby Namibia after hearing from friends that it was one of their favorite African countries. Come with us as we learn about a country that is perhaps surprisingly prepared for tourists. We will talk about seeing 4 out of the “big 5″ safari animals. Our trio talks about miles of sand, sand storms and riding camels but also talks about visiting the show and seal colonies. The camping was easier than expected and the food was more diverse (you won’t believe what they found on pizza). 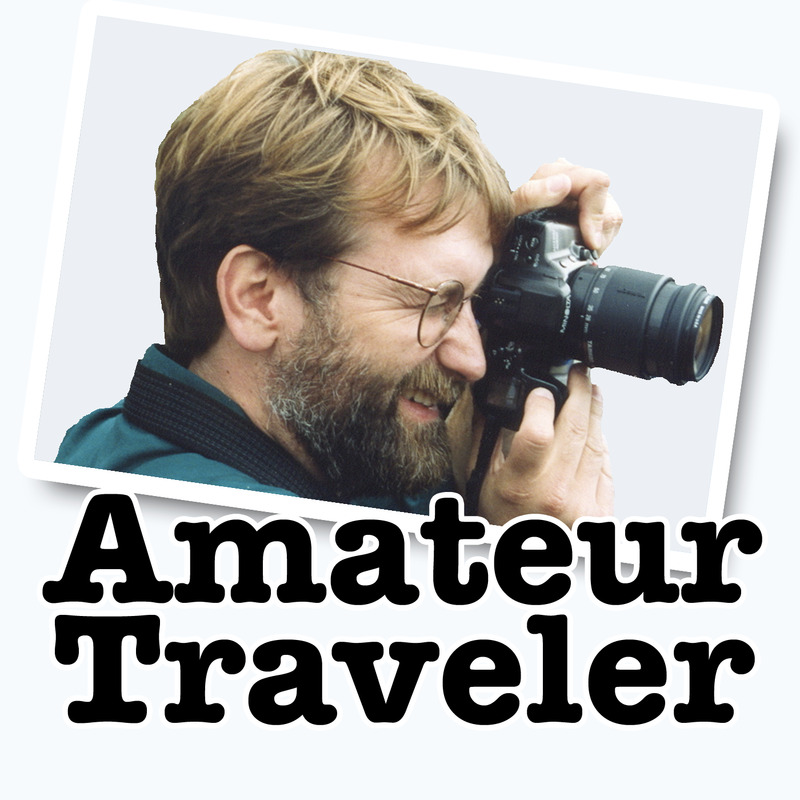 The Amateur Traveler talks to Matt Anderson about a recent trip to Taiwan during the Chinese new year celebration. Matt, who is an English teacher in South Korea, started his trip in Taiwanâ€™s capital of Taipei before exploring the eastern coast and the rich heritage of Taiwanâ€™s aboriginal people in the south. In Taipei Matt recommends eating at the Shilin night market where the fried chicken and the sausage are particularly good. Matt and his girlfriend also went to Taipei 101 (which is now the worldâ€™s 2nd tallest building), the Chiang Kai-shek memorial, and an assortment of temples including the Confucius temple, the Bo-an temple and the Longshan temple. Matt explored the rugged and less populated east coast on a bike trip that started in Hualien. He visited the Taroko Gorge near to Hualien and nearly spent a night in jailâ€¦ but itâ€™s not what you think. The Amateur Traveler talks to Sean Keaner of the BootsNAll travel network about the city of Portland Oregon. Sean describes the independent character of the city that is expressed in its brew pubs, food carts and hip culture. It is also evident in the famous Powellâ€™s bookstore. Portland has a reputation for being rainy but Sean tells us when to come to Portland, where to ride a bike and where to find some good Vegan food. If Vegan is not your style find out where to find a pork chop over 4 inches thick. The Amateur Traveler talks to Matthew Stone about his home in Northern Virginia. Matthew describes things to do in Northern Virginia either as a side trip from Washington D.C. or a trip in its own right. We start at the famous monuments and Arlington National Cemetary just south of the District of Columbia and proceed to George Washingtonâ€™s home of Mount Vernon. Matthew then describes some parks and places to escape the city a short drive away. Sure you know that the National Cemetery is in Virginia but did you know you can find a Black History museum, an Apothecary museum and a Tony award winning regional theater all within walking distance of the Metro? Add in some National Parks, Civil War Battlefields, and the SR 71 Blackbird and you may just have to rearrange your plans for your next vacation to the nationâ€™s capital. AT#75 - Authors of "Europe From a Backpack"
Share: AT#75 - Authors of "Europe From a Backpack"
AT#72 - Joe d'Eon, Airline Pilot and host of "Fly With Me"
Share: AT#72 - Joe d'Eon, Airline Pilot and host of "Fly With Me"
Share: AT#50 - Washington D.C. The Amateur Traveler is an audio travel show that focuses primarily on the question "where should you travel to and what to do when you get there".